Trick or treat: a cobra masquerading as a cable, waiting to strike the unwary. 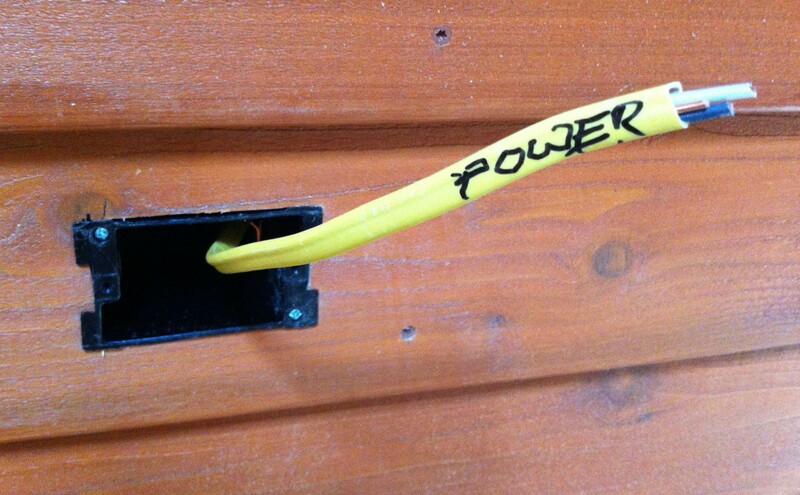 I never had any intention of wiring my tiny house myself. I knew I could learn it if I had to but when you’re building a house on your own there are some tasks you need to let go of to save your sanity. Since electricity scares the bejeezus out of me, it was a no-brainer to hire that one out. Then two things happened: I got an estimate for what it would cost (yikes!) and I met Todd Clay, the owner of Gorge Electric, who took an interest in my project and agreed to mentor me if I wanted to take it on myself. So that is how I came to be a reluctant electrician. 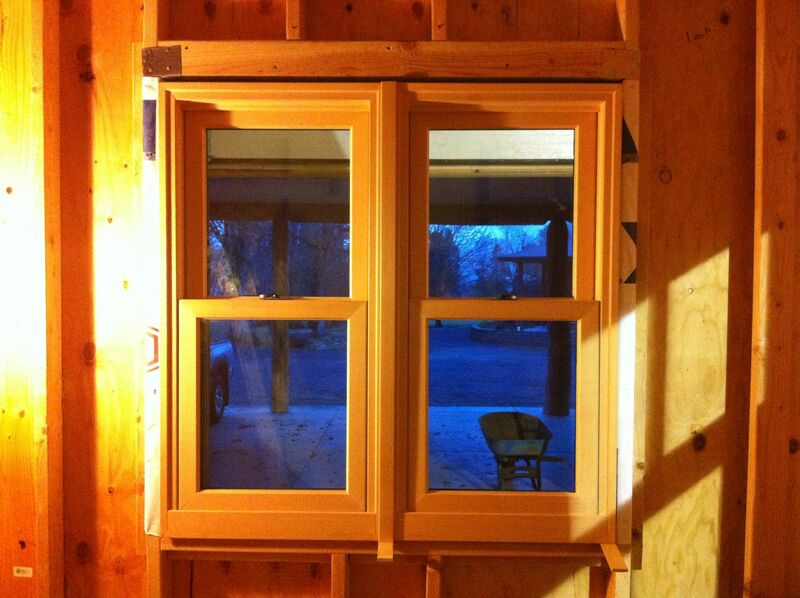 I am way behind on progress updates, but I realized that the primary purpose of this blog is to share the lessons I’ve learned while building Naj Haus and since the wiring experience was a pretty big deal, it’s worth backing up and going over it in more detail. Jumping into the world of electrical wiring as a complete novice required learning entire new vocabulary, tool, and skill sets, and a mind-boggling array of materials and safety precautions. Fortunately I had Todd to guide me with all of his expert advice, but he’s a busy guy and we could only arrange periodic check-ins and inspections; the rest of the time I was on my own. While the internet is a wealth of information, it’s all so piecemeal it can be hard to see the forest for the trees. As I gradually wove my way through the morass, it began to make more sense. I thought I would present my experience as a case study so that others might not have to go through the same torturous process of figuring out how all the pieces fit together. There are several caveats. This is not a step-by-step instruction manual but more of a framework to help you understand where you should focus your own research. I’ll point out tips and resources I used, but you may find better ones. Keep in mind I am not licensed and you shouldn’t take anything I say as correct. Code varies from location to location and from year to year so you really need to work with someone qualified. While tiny houses on wheels do not require permits and inspections, you definitely want to make sure your house is wired properly, both for your safety and that of others, and to help get insurance if you want it. What I want to do is describe the process I went through, tailored to my situation, and point out how you can adapt it to your own. 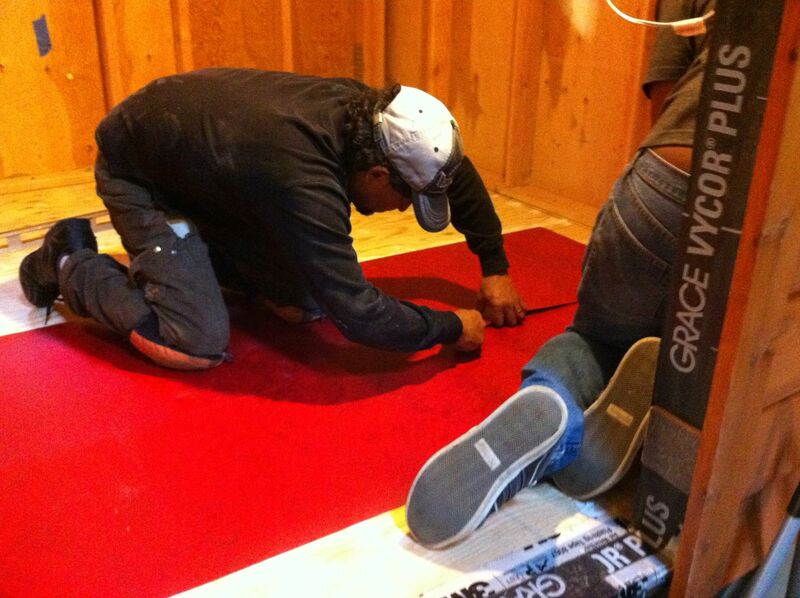 I also want to highlight some of ways that wiring a tiny house is slightly different than wiring a traditional house, and what safety precautions you need to be aware of besides the obvious ones talked about in the internet links. Even if you’re not doing the wiring yourself, knowing about some of these issues will help you work with your electrician. Finally, I’ve added lots of photos since there are never enough visuals when you’re trying to stumble your way through something you haven’t done before! They may or may not be pertinent to your situation but if I can help save you some headbanging and muffled swearing, then it’s all worth it. What is a device box? 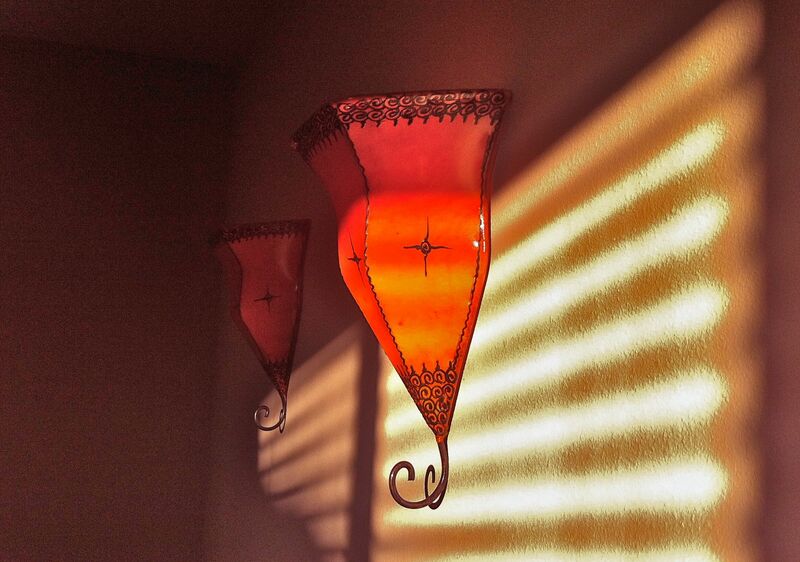 Some sconces I got, hanging in a temporary spot. Silver lining on a bleak early spring day. Okay, from the poem above, you probably think this is going to be about how I’ve finished my cabinetry and built-ins, perhaps my whole house. Given that it’s been four months since my last post, this would be a reasonable assumption, but alas, this is not the case. 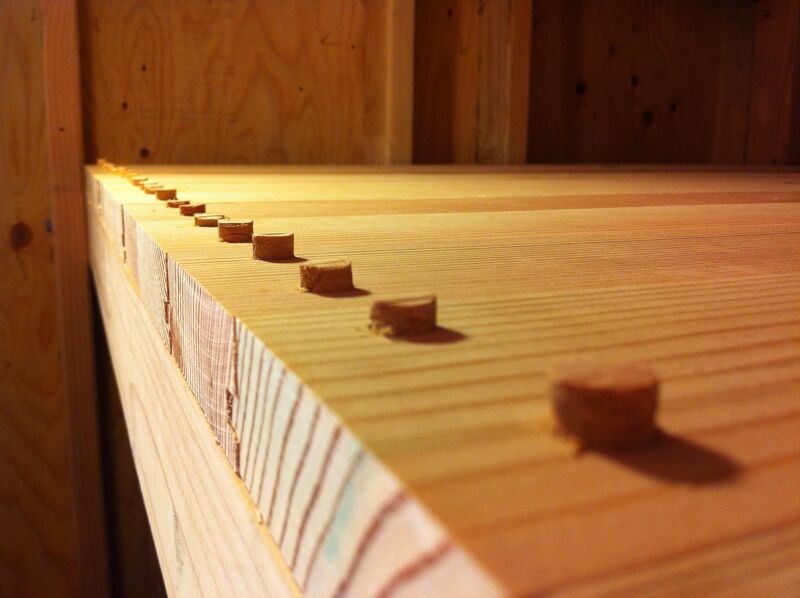 In fact, I am amazed at how slow my progress has been as I approach my two-year mark from when I started building. In my defense, the first year I was living in one state and building in another when I could get time off work, and this last year has been beset by obstacles. However, it hasn’t been wasted time. Much has been learned and I am very happy with what has been accomplished. Though more battle-worn and less starry-eyed, I’m still as excited as ever about my tiny house. Good thing, eh? You’ve probably played the parlor game favored by the Surrealists called Exquisite Corpse, where one person begins a drawing on a folded piece of paper and passes it to the next person who adds to it not knowing what the first person drew. This continues until the last person adds their contribution and the paper is unfolded to see what this blind, collaborative creative process produced, quite often something nonsensical or, ahem, surreal. The idea can be applied to other art forms as well. In film school, we would pass a camera around not knowing what the previous filmmakers had filmed, resulting in typically disjointed, but interesting, short films highlighting our very different cinematic styles. 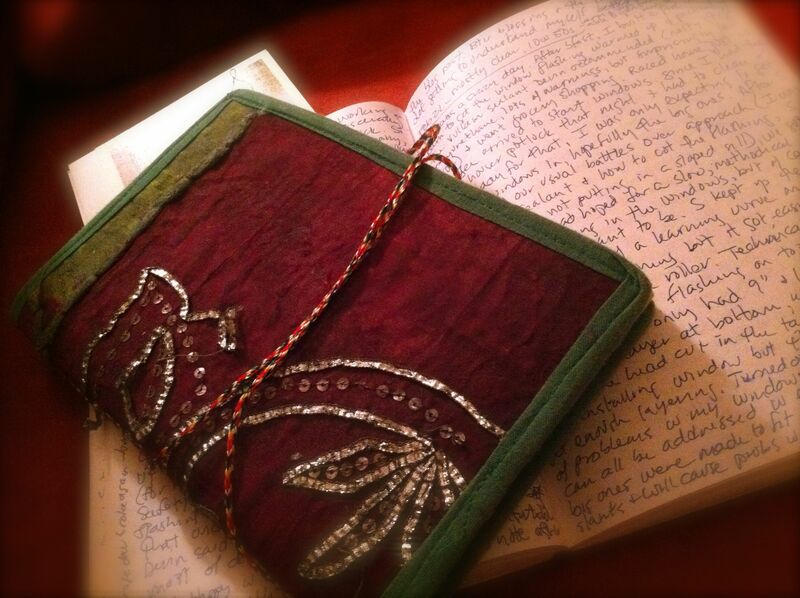 Written stories or poems can also be developed this way. It’s somewhat similar to the found poetry that grew out of the Dadaist movement. Like with the exquisite corpses, the appeal of found poetry, or found art, is the fresh insights or unexpected synchronicities that occur when artists portray commonplace objects or text in a new light. The master (Ben Kelso) at work. Allergy and Asthma Friendly-certified, and also antibacterial (it’s used in hospitals). See here for more on health aspects of marmoleum. Also, the adhesive, Sustain 885, is non-toxic, zero-VOC and won’t off-gas; it’s safe for those with chemical sensitivities. Read this buyers guide for more information about marmoleum types and installation. In The Sound of a Wild Snail Eating, Elisabeth Tova Bailey tells the inspiring and intimate story of her uncommon encounter with a Neohelix albolabris—a common forest snail. While an illness keeps her bedridden, Bailey watches as the snail takes up residence on her nightstand. Intrigued by its molluscan anatomy, cryptic defenses, clear decision making ability, hydraulic locomotion, and mysterious courtship activities, Bailey becomes an astute and amused observer, providing an engaging look into the curious life of this overlooked and underappreciated small animal. She comes to a greater understanding of the interconnections between species and her own human place in the natural world. The Sound of a Wild Snail Eating is a remarkable journey of survival and resilience, showing us how a small part of the natural world illuminates our own human existence. 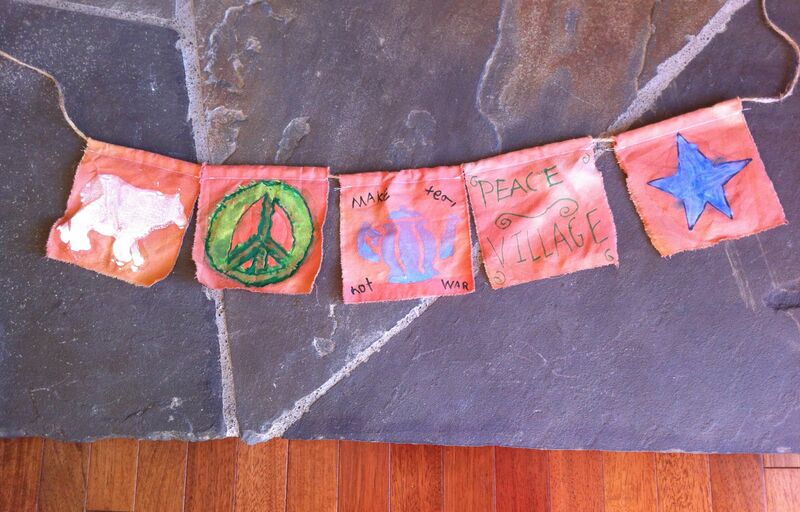 “Make tea, not war” – peace flags made by my visiting nephew at Peace Camp. So after the craziness of June and July, I was now a full-time Oregonian – but the craziness continued. I had a month before I turned 50 and I was determined to move my house outside and spend my first night in it on my birthday. To do this, I had to get my trim and siding up. It seemed doable, but I should know better by now than to impose a deadline on myself. 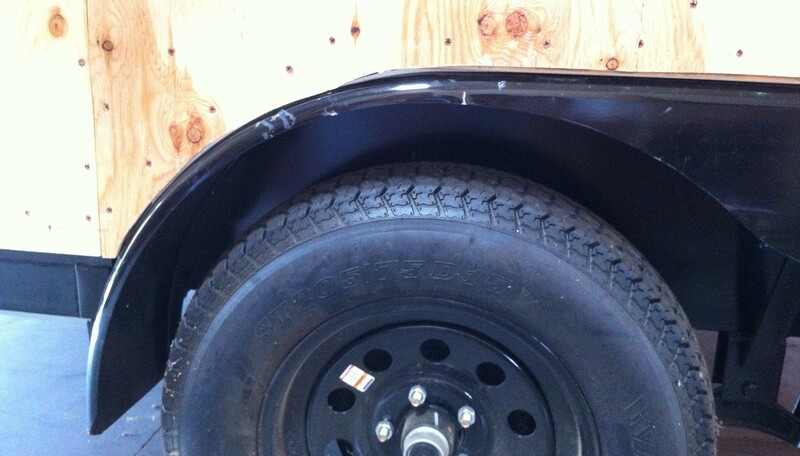 One of the many transitions I dealt with this summer: the space between the sheathing and the wheel well. This summer has been intense. Many significant life changes and lots of activity on the tiny house front as I tried to hit some self-imposed deadlines. Way too much stress, and the blog has suffered as a result. But now I’m catching my breath again and realizing a major update is in order. As I pulled photos to include, I realized that the update was going to be excessive even by my epic post standards, so I’m breaking it down into three separate entries. This one covers the month of June. July and August to follow shortly. For those of you not familiar with my story, the quick background is that I started building a tiny house in Oregon while still living in California. I’ve spent the last year traveling back and forth doing discrete building stints. I originally thought I would move my house down to the Bay Area while I continued at my job as a grant and project manager for the Coastal Conservancy, a state agency where I’ve been for the last 25 years. However, as I got deeper into the process of building, it jumpstarted a whole re-evaluation of where I was in my life and where I wanted to be. I was about to turn 50, I wanted out of the city and the constraints of my desk job, and I really wanted to get back to my native Oregon, closer to nature and family. While normally I wouldn’t be able to live off the tiny pension I would get with early retirement, the low expenses of the tiny house should make it possible for me to piece together an alternative lifestyle I hadn’t thought possible. I’ll still need to work some (I’m retiring from state service, not retiring altogether), but by having my basic needs covered, I have much more flexibility in what I choose to do and how I incorporate my work life with the rest of my life. All of those life changes and transitions happened this summer. It’s been a crazy time: I was simultaneously making several 12-hour trips up to either build or move belongings, transferring major work projects to new staff, cleaning out and organizing work files, saying my goodbyes to the places I’ve lived and the dear friends I’ve worked and played with for the last 25 years, coming to grips with leaving and starting over in a familiar but new place and a much different lifestyle, learning the ropes of life on a blueberry farm, getting my head around the idea of “retiring” (and all the endless bureaucratic forms that entailed! ), building new friendships and connections in my home-to-be, packing up and cleaning my apartment, and actually moving and getting settled in with all that requires. On top of this, I set myself a goal of finishing the exterior of my house so that by the end of August I could move it out to it’s initial parking spot behind the barn and spend my 50th birthday night in it. I love the word burgeon. 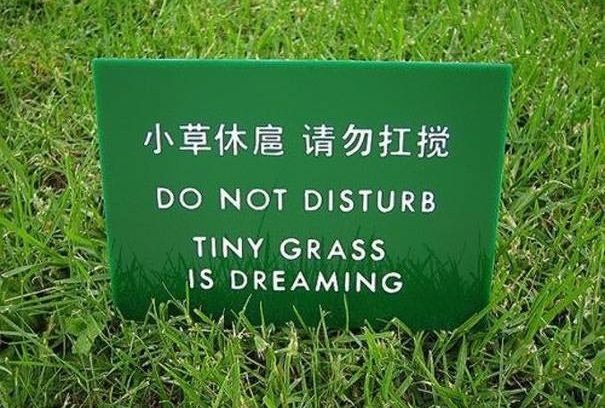 I use it a lot in reference to my growing tiny house. It means to bud, sprout, put forth, develop. It originates from the late 1200s, Middle English for bud or plant shoot, deriving from the Latin word burra – wool or fluff, presumably from the down covering certain buds. To me it also represents imminent potential and those powerful forces of nature that make all things come into their own. 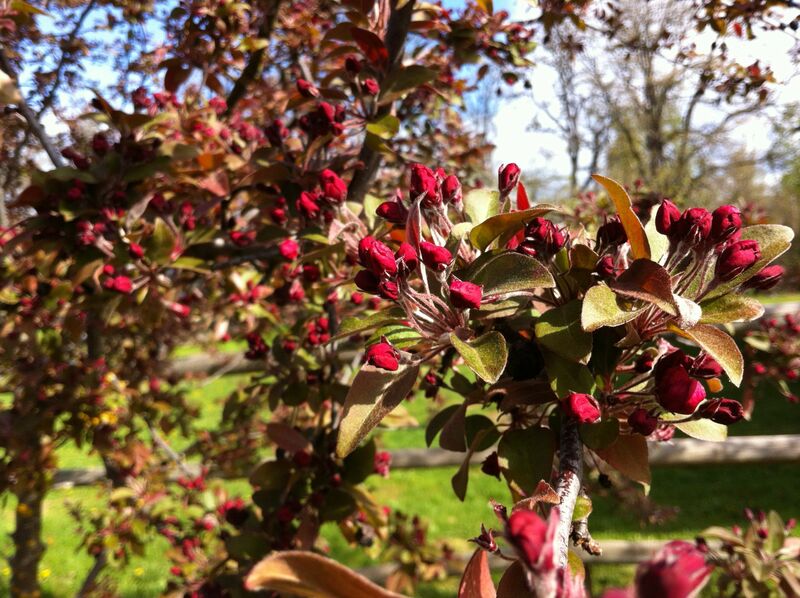 My recent sixth building stint was both a revel in a full spring blossom riot and a lesson in accepting that everything must take its natural time and course. You can’t hurry a bud. And sometimes you are your own bud. And sometimes you just have to be patient with yourself.